Filmmaker Daniel Gordon investigates the 1988 Olympic race that resulted in disgrace for Canadian sprinter Ben Johnson, a gold medal for the USA's Carl Lewis, and major controversy over drug testing. In the history of the Olympics, there's never been a controversy quite like what ensued following the men's 100-metre race at Seoul in 1988. 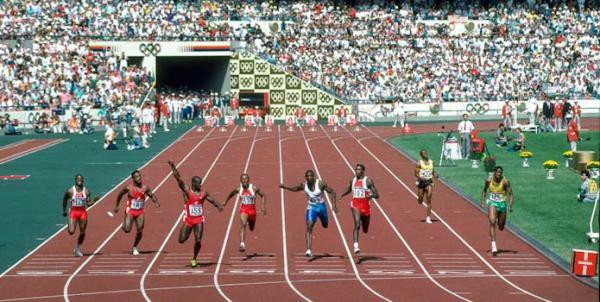 The match pitted fierce competitors Ben Johnson (Canada) and Carl Lewis (USA) against each other. Lewis was known as a savvy careerist who became an American hero at the Los Angeles Olympics in 1984. Johnson was his chief rival, considered an underdog due to his recovery from a pulled hamstring. In the time of 9.79 seconds, Johnson edged out in front of Lewis to win the Seoul sprint. Instantly, he became a hero across Canada. But that wasn't the end. Two days later, in a reversal of fortune, the Olympic Committee announced that Johnson had failed a drug test. He lost his medal to Lewis in disgrace. A mystery still shrouds the race. Was Johnson exceptional in his steroid use, or merely the fall guy for a widespread practice? Six of the eight finalists in the 1988 race have since been implicated for drugs - although some still deny any wrongdoing. Filmmaker Daniel Gordon, who has earned acclaim for his sports films shot in North Korea, digs into the controversy, conducting extensive interviews with Lewis and Johnson as well as competitors, coaches and Olympic insiders. He uncovers layers of intrigue, deception and favouritism that change our perception of the way this story has previously been told. The Seoul race wound up being the world's wake-up call to drugs in sports. Now the problem runs rampant throughout professional and amateur athletics. As drug testing gets more sophisticated, so do means of evading it. This powerful story from the past forces us to question what we expect from our athletes as they pursue records in the name of national pride, and is vital to understanding the future of sports. 2012 | Festival international de Toronto, Canada, Sept 2012.